Can Duncan balance the demands of his personal life with the supernatural demands of his career? 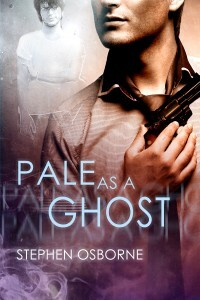 Pale as a Ghost (m/m) by Stephen Osborne, available from Dreamspinner Press. Private detective Duncan Andrews’s best friend Gina is a witch. His dog is a zombie. And his dead boyfriend, Robbie, is a ghost. So it’s hardly any wonder that he uses his connection to the supernatural to help him solve cases. Good thing, too, because Duncan has his hands full. Janice Sanderson, the richest woman in Indianapolis, wants him to find her stripper daughter, Brenda, and another client is having some trouble with a specter haunting her family home. On top of that, Duncan has decided to add dating into the mix, though after Robbie’s death, he’s not sure he’s ready. When Duncan meets Nick while tracking down a lead on Brenda’s boyfriend, he shelves his doubts and agrees to a date. Robbie doesn’t make it easy on him, showing up to spoil his chances, but that is the least of Duncan’s worries—because one of his clients’ husbands is missing and there’s a serial killer on the loose—one Duncan fears isn’t human.